Published: Nov. 2, 2011 at 01:26 p.m.
Cam Newton would still go No. 1 to the Panthers if the draft was held again today, but a lot would change after that. This has been a really good season for rookies making an impact. There are obvious cases like Cam Newton as well as several other good first-round picks and under-the-radar guys who have contributed. As we near the midway point of the season, a common practice around the league is for teams to a do re-draft to see how their evaluations from April stack up now that we have two months of games to better assess players. Have rookies exceeded, met or failed to meet expectations? Most importantly, teams attempt to figure out what character or talent traits have led to a player succeeding or failing so that any potential trends can be used in future evaluations. With that, I've taken a detailed look at the first round of the 2011 NFL Draft and predicted how teams would pick now. There's a different look to the top 10, including three quarterbacks now going in the top five, and things really start to shift toward the middle of the round. 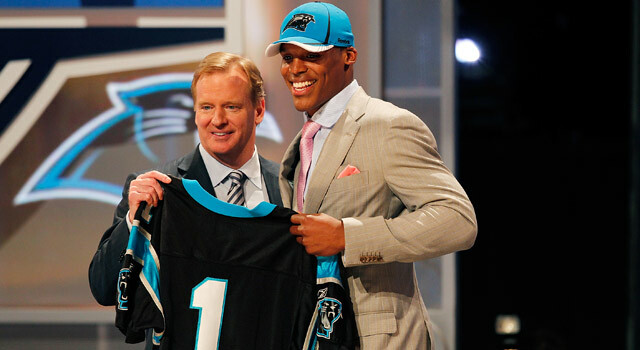 Adjusted pick -- Same: Newton has exceeded all expectations and should set multiple rookie passing records. With Newton at the helm, the Panthers have scored just nine fewer in points through eight games than they did all of last season. The way Andy Dalton has played for the Bengals, he's outplayed his second-round draft status. 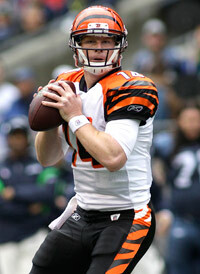 Adjusted pick -- Andy Dalton: There's no doubt that Miller is a good player. He has six sacks, but the Broncos are a quarterback away from being a potential playoff team in that division. Despite being 2-5, Denver has talent and Dalton gives them a better chance to win. He's another rookie QB playing above expectations. Dalton's not flashy, but is smart and steady. Adjusted pick -- Same: Dareus is the primary reason the Bills are giving up nine fewer points per game this year. At this time last year, they were 0-7 and now they're 5-2. He played really well against Washington (2.5 sacks) and is starting to assert himself in Buffalo. Adjusted pick -- Same: The Bengals lost their three top receivers from last season and Green has provided a go-to option in the passing game. He has 33 receptions and five touchdowns. They have five wins already after finishing with four last year. Green and the rest of the draft class have played a major role in that accomplishment. Adjusted pick -- Christian Ponder: History says it's far easier to find a corner than a quarterback. Ponder has played really well in his two starts and his lack of arm strength would be mitigated by the fact that the Cardinals play indoors. He's very smart and recognizes things quickly. Peterson has started seven games and taken back two punts for touchdowns, but when you have continued issues under center that has to be your top priority. This also would have allowed the Cardinals to bypass the Kevin Kolb trade. Adjusted pick -- Same: Jones is still the guy here. You could very easily flip Green and Jones. Even though Jones has been hurt, he leads the Falcons in average yards per catch (14.3 yards). He's also a good blocker, which is important in Atlanta's run-based offense. Adjusted pick -- Same: Smith is a pass rush specialist. He looks like Jevon Kearse when he came into the league and had 14.5 sacks as a rookie. If Smith was a horse, the way he runs make him look like Secretariat compared to going up against a bunch of plow horses. Adjusted pick -- Patrick Peterson: With Matt Hasselbeck playing well and the team in the playoff race, the Titans can afford to bypass a QB for the future and go after the best player still on the board in Peterson. The LSU product is a solid corner and gives Tennessee someone to pair with Cortland Finnegan. Peterson also brings another dimension with his ability in the return game. Adjusted pick -- Nate Solder: The difference is Smith will be good, but Solder is ready to play right now because he was a five-year player and has more experience. Solder's stronger and more polished. Adjusted pick -- Same: He's started the bulk of their games and moved the team well at times. He's mobile and has a good arm but needs to work on accuracy. The Jaguars also have to get him some more weapons. Adjusted pick -- Von Miller: Miller falls here. It's not necessarily because of anything he's done wrong, but he's a great fit for the 3-4 in Houston as opposed to the 4-3 in Denver. He's an excellent pass rusher and can make plays after dropping back. Adjusted pick -- Jake Locker: The Vikings still go with a potential QB of the future. Locker's the guy they really wanted all along and he would be playing now on a struggling team and learning on the job. No one realized he played hurt last season, which hurt his stock. Locker has good poise and arm strength. Adjusted pick -- J.J. Watt: Watt is probably better suited for a 4-3 defense because he's a more effective rusher with his hand on the ground. He shows good effort and is one of those guys who never quits. Fairley is talented but has struggled to make an impact due to injury. Adjusted pick -- Adrian Clayborn: Quinn had a good game last week in the win over the Saints, but hasn't done much else. Clayborn has seven starts and is a good pass rusher (three sacks) who gives effort on every play. Adjusted pick -- DeMarco Murray:While Pouncey has been good, he's a center and Miami needs someone to put some juice in the offense. Reggie Bush was supposed to be that guy, but Murray is capable of having a big game every week. Murray's not only a runner with quickness and acceleration but is also a good receiver. Adjusted pick --Same: No need to change here. Kerrigan has seven starts playing a new position, 3-4 linebacker as opposed to defensive end. He has taken to the position naturally, making plays in space. Adjusted pick --Tyron Smith: So Solder and Smith flip positions. Smith is 20 and is going to be very good. But he lacks the strength and experience to be successful at this point. Eagles DE Jason Babin killed him last week with a few spin moves. Adjusted pick -- Phil Taylor: This is a breaking point as far as the talent level dropping a bit. Everybody before this point has Pro Bowl potential off what we've seen so far. The Chargers opt to go for Taylor over Liuget because he could be a nose tackle, which is a bigger priority in the 3-4. Taylor has seven starts and three sacks. He's played above expectations and is more powerful than Liuget. Adjusted pick --Same: He's still trying to come back from a broken foot, but has the potential to be a solid starter when he gets healthy. Adjusted pick -- Jabaal Sheard: With Clayborn already off the board, Sheard is another solid 4-3 end option. He has seven starts and gives you good effort and is an excellent pass rusher. Adjusted pick -- Nick Fairley: The Browns would be without their top two draft picks in this scenario. Fairley is another guy who has been limited due to injury, so I'm basing this off his play at Auburn as an inside pass rusher with good quickness. Adjusted pick -- Same: Quarterback would have to be a consideration, but the top-tier options are all gone. Castonzo is right where he should be. He had four starts before he got hurt and played well. Adjusted pick -- Stefen Wisniewski: Wisniewski's been a big surprise. He has blocked well in both run and pass and is one of the reasons why the Raiders have the second-ranked rushing attack. He's a strong, tough football player and has more experience than Watkins. Adjusted pick -- Same: He doesn't have any sacks, but has started every game for the Saints. Jordan plays on the strong side, which limits his chances to get sacks. He's been very solid vs. the run. Adjusted pick -- Same: He's been playing right tackle out of necessity, but his best position is probably guard. He could be moved to the interior at some point and be a Pro Bowl player. Adjusted pick -- Same: He had a breakout game vs. the Chargers. His broken hand slowed him down to start the season. Baldwin's a big guy who runs good routes and has excellent speed for his size (6-foot-4, 228 pounds). He doesn't look that fast until he runs right by you. There's very little difference between Green, Jones and Baldwin. Adjusted pick -- Same: He's been hurt, but from what we saw in preseason and some limited action is a good cover corner. Smith's going to be a starter and has Pro Bowl potential. Adjusted pick -- Same: I almost took Stevan Ridley here. Ingram is a solid power back and a nice option on the goal line. But with little flash to his game, he will never be a star. Adjusted pick -- Same: Carimi has been out since Week 2. In his brief stint as a starter, he made a difference on that offensive line. He's really strong and has really good hands. He's best suited to stay at right tackle and should be a strong starter going forward. Adjusted pick -- Same: He's started seven games and exceeded expectations. Wilkerson has good size and athletic ability, which should make him a viable part of that defense for years to come. Adjusted pick -- Corey Liuget:Liuget is strong and shows flashes of being able to make big plays. Consistency in his game hasn't been there yet and that needs to improve. Heyward hasn't gotten on the field, and I like Liuget better. Adjusted pick -- Danny Watkins: Sherrod has upside but doesn't have a lot of experience or strength. Watkins is a tough, hard-nose guy. See what the Eagles did against the Cowboys as proof of that. Robert Quinn (originally drafted 14th), Mike Pouncey (15th), Cam Heyward (31st), and Derek Sherrod (32nd). Andy Dalton (35th), DeMarco Murray (71st), Jabaal Sheard (37th), Stefen Wisniewski (48th).